I decided since its such a lovely community over at Soul Scrappers that I might do some of the challenges set for the month of July. 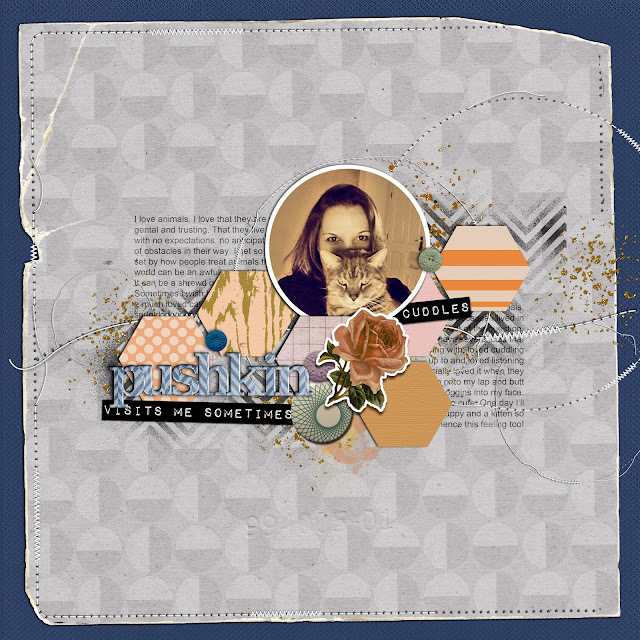 I saw a fabulous sketch template created by Joy Anderson which appealed to me so created this page below for the NSC12 challenge. Do you like a little vintage? Enjoy playing with ribbon and lace and pieces of old paper? Well this Soul Scrappers quest is for you. Participants will be sent a package of FREE vintage embellishments to use on your layout or off the page creation. Everyone will receive the same items (or very similar) and you will be required to use all (or as much as you possibly can) of these items. The addition of background cardstock or paper is allowed. And your layout or off the page item MUST be in a vintage style. This challenge is open to 15 member participants only. There will be a separate challenge running for members of the design team. In order to be included in this quest you MUST also have entered two other challenges from those available for July. That gives you the choice of some nine (9) Soul Team challenges in which to participate plus one from our lovely July Guest Soul Team member, Emma Stafrace. The list will open for registration on July 21st and I will take names until July 31st unless numbers are filled before that so first in best dressed. I will mail out the packages at this time so once you have signed up you will need to message me your postal details. Three prizes will be awarded for this quest (plus a separate prize for the design team). Pictures of these prizes will be put up once the registration opens. The deadline for submitting your creations into the gallery, tagged SSQ13 will be August 31st. REMEMBER - You have until registration opens on July 21st to complete two (2) of the July challenges - you must have completed these two challenges to be eligible for SSQ13 registration. Are you up for a quest? Hats off too you....love those hexagons...& fancy having donr the other part without realising !!!! I'm off to work for 3 weeks... Be near enough to 12 hr days plus Saturdays...so I'll be outta the loop!!!! Least I can blog on the train:):):) have to get my fix reading blogs!!!!!! Thank you...think I'll need it...the fairy sounds good:):):) thank goodness for laptops to help the commute go quicker!!!!!! Love what you did with the shapes...looks fab! What a. Fabulous page, Emma!! You did a fantastic job with those challenges! Love your design and how you've layered everything. And such a sweet photo! I just love your work to bits! !